9 brown, 7 blue, 6 pink, 6 green, 6 plaid, 4 gold, 4 peach, 3 green plaid, 2 white, 2 pink floral, 1 different green, 1 peach plaid. 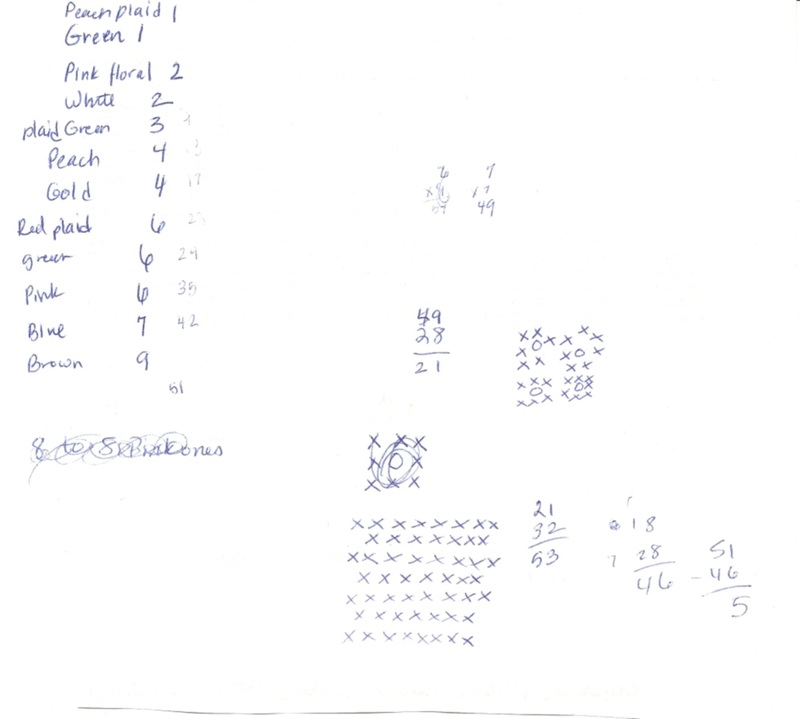 Yes, that is 51, and worse, only 5 sets that can be laid out as traditional flowers in sets of six. Awesome job planning. So I laid out four of the five flowers sets and I have 3 lights and 2 darks. Except that the one set of dark a weird brown color I am not thrilled about. So after some complex drawings, I decided just put them together randomly in alternate lines of 8 and 7. This means I only need 2 more flowers to make 53. Don’t ask me to explain the math. I will show you my flower football notes which I believe will get me partial credit on any quiz. Anyway, I was starting to think about how am I going to put this sucker together. 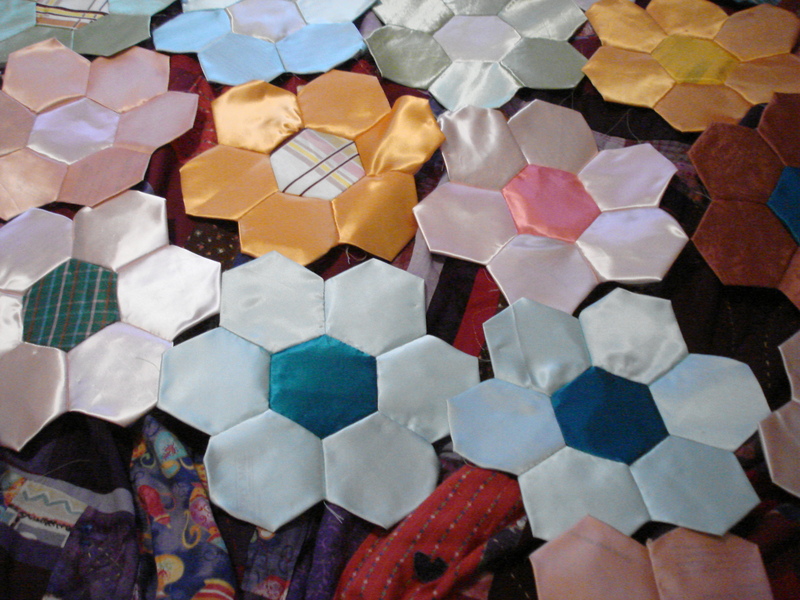 I have made satin quilts before but a long time ago, before I cared about washability and stability. That would probably be about the time I started this quilt. Any recommendations for what fiber I should use batt and backing would be awesome. I don’t believe I have any silk fibers which means the satin is either polyester or rayon. On another topic, the ufo for this month is the cross stitch which I have been working on for at least eight years. I’m 0 for 2, on finishes for ufos this year, and I am afraid this may be 0 for 3. But I will give it a shot. No advice here. I have never made a satin quilt, but it already glows. Thanks. I love the colors, too, even though I have doubts about it’s practicallity. Thanks for stopping by.